The knee is one of the most complex joints in the entire body and it serves the vital role of holding up and stabilising your bodyweight. 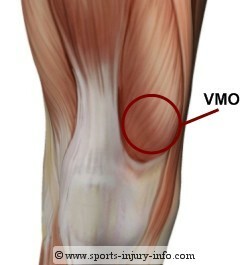 Unfortunately it’s one that takes most of the abuse from most of our activities – almost every sport puts a great deal of stress on this poor joint, almost every jolt or accident or trip or fall goes first through the knee and it’s limited ability to flex laterally means you’re in line for damage, pain or wear…. So how to prevent knee pain if you’re lucky enough to not have it? The number-one secret for happy knees is to stay at a healthy weight. Every extra pound you pack on puts about 4 extra pounds of pressure on your knees when you walk! 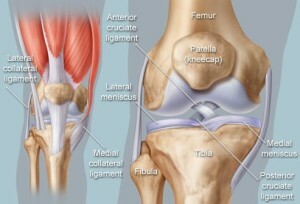 So just adding 5 or 10lbs in weight can have a dramatic effect on your knees. Avoiding impact as much as possible is key – it’s amazing how quickly it builds in your knee (as an example – if you weigh a typical 10 stone, a high impact landing will put around a 40 stone load through your knee!!). If you are engaged in this kind of activity, use ‘soft knees’ let the muscles do their work! Footwear and flexibility is important, ditch the high heels, sandals, flip-flops etc and use footwear that supports your feet and arches. Finally, flexibility, stretching and having the correct muscle balances are key – keep legs and hips supple.. Work your inner thighs, most people (except horse riders!) have under strength hip adductor muscles which are crucial for absorbing stress and not straining your knee. And if you do have knee pain? Well, the scope of that is far far too great to cover here but we can help through a short consultation and assessment (contact us HERE for more help and info). But as a general rule….sometimes the pain is completely unnecessary and can be eliminated if the right diagnosis is made and the right treatment put into motion. 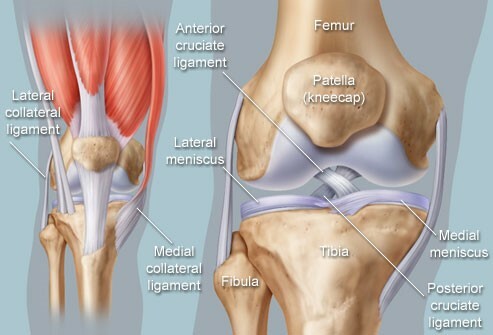 Nearly always sufferers can ease pain by strengthening the vastus medialis obliquus (VMO); the muscle which helps controls the way the knee cap moves when we bend and straighten our knees. This muscle is incredibly important for patellar control during knee flexion and extension and therefore essential to keeping our knees happy. We can provide you some simple exercises to do in the comfort of your own home (where appropriate) to strengthen this muscle, again, contact us HERE for more help and info.